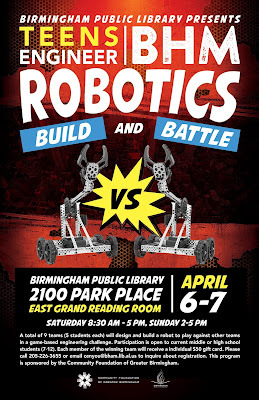 The Central Library downtown will host the inaugural Teens Engineer BHM Robotics Build and Battle Competition this Saturday, April 6 in the Central Library East Grand Reading Room. This fun, friendly competition will kick off at 8:30 a.m. and conclude at 5:00 p.m. 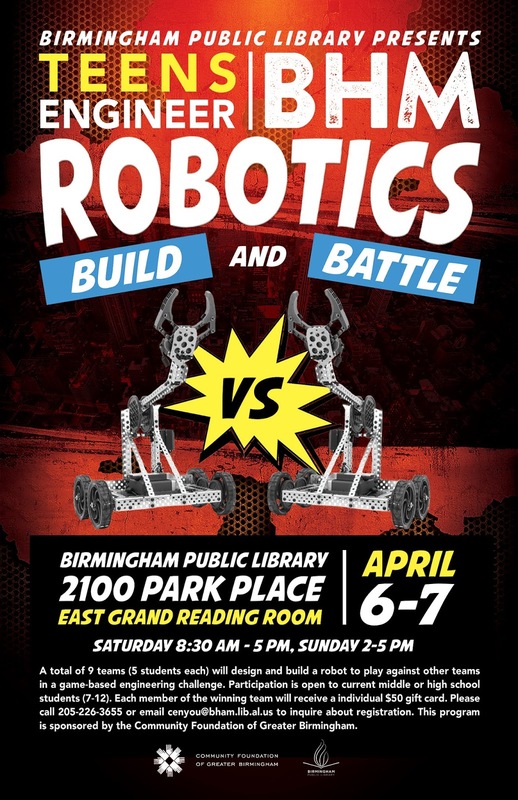 The Robotics Build & Battle will feature 50 tech-savvy teens from high schools across the metro area, including Huffman in Birmingham, Oak Mountain in Shelby County, Hueytown and Fairfield. Teams, comprised of five students each, will design and build a robot to play against other teams in a game-based engineering challenge. Participation is open to current middle or high school students in grades 7 through 12. Each member of the winning team will receive a $50 gift card. The event will kick off the Birmingham Public Library (BPL)’s observance of 2019 National Library Week, which begins Sunday and concludes Saturday, April 13. Teens Engineer BHM is a partnership between BPL and the University of Alabama at Birmingham School of Engineering. The program is sponsored by a $95,000 grant received in 2017 from the Community Foundation of Greater Birmingham.